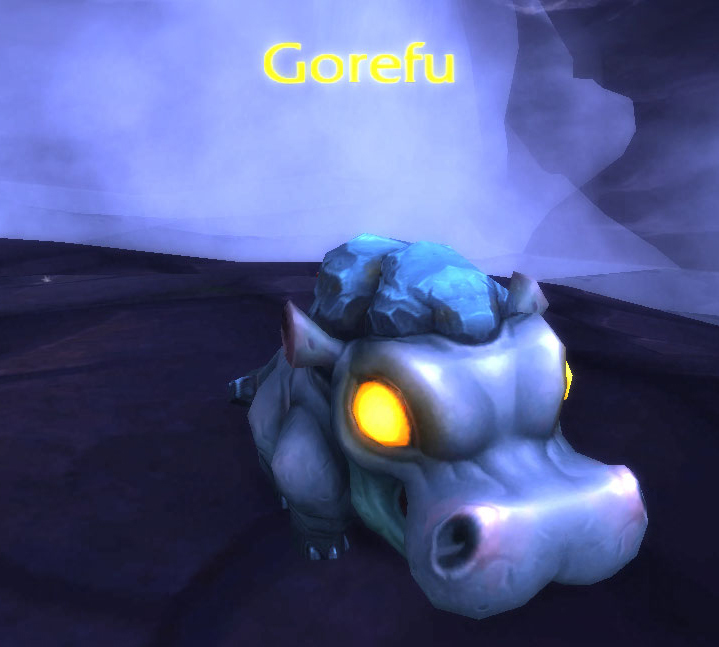 Gorefu is one of the 3 Pests you have to beat to complete the quest Pets vs Pests, required to unlock the Menagerie in your level 3 Garrison. You’ll find him near your Garrison’s fishing hut. As long as you have 3 higher level flying pets that’ll do the job well. 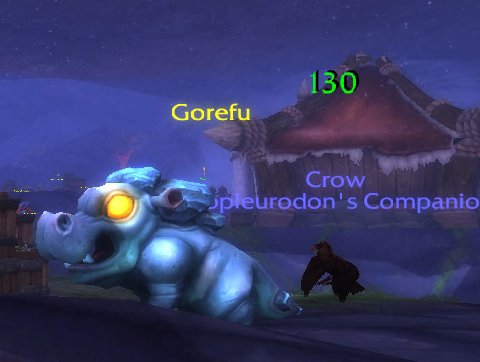 I do like the Crow (or Gilnean Raven) specifically, but as long as you have 3 pets that deal flying damage above level 23 or so, you should be able to beat this fight. Aside from the Crow, the pets I chose are tamed at a relatively high level, so don’t sweat it too much. Gorefu is going to be slower than any bird you have, so if you’re using the Raven, you’ll want to just attack a bit at the start, until Gorefu casts Mudslide. After the Mudslide, you can use your Raven’s Darkness to overwrite it. 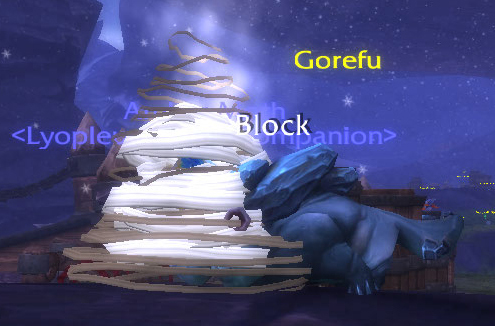 I like this combo a lot, because Gorefu uses Feed, which will heal him for the damage it does, usually just over 300. With Darkness, healing is halved, and it also grants a chance that Gorefu will miss it altogether. 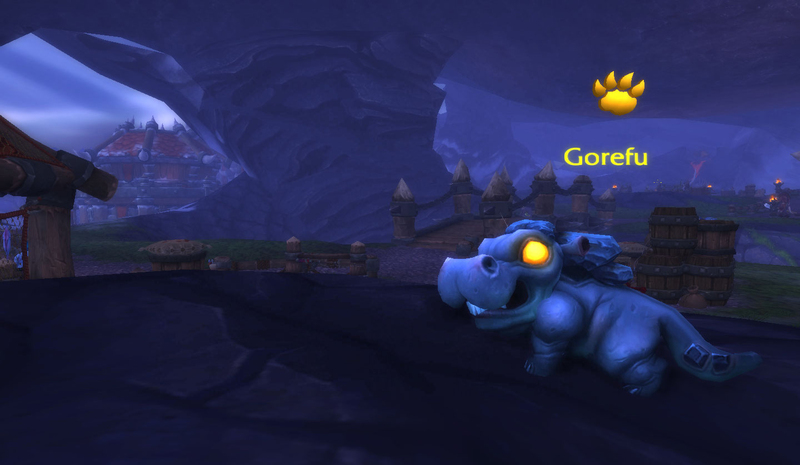 Alternately, you can use a pet with a dodge, like the Dragonbone Hatchling with Lift-Off or a moth with Cocoon. I’m generally bad at counting down turns, which is why I favor the Raven. If all you’ve got is a handful of Owls with no dodges, that’ll be okay as long as you can burn him down quickly enough. Aside from Feed, this fight is relatively straightforward. 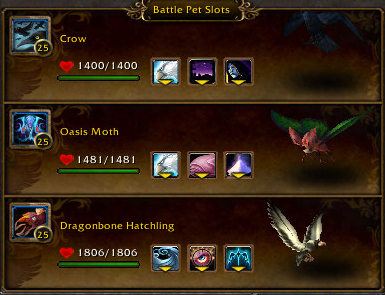 If you’re having trouble and looking for a few more options in terms of a quick bird to tame at a higher level, the Sandy Petrel or Garden Moth in Jade Forest are easy pickups, using the portals from Orgrimmar or Stormwind. There are usually a few Silky Moths hanging around near the Hyjal portal, or the Oasis Moth in Uldum. If you’re starting from the Shrine in the Vale, there are usually a couple Gilded Moths or Effervescent Glowflies hanging around. What I’m saying is, moths. Use moths. This entry was posted in Menagerie and tagged menagerie, strategy, WoD on September 9, 2014 by Liopleurodon.